Gameron is a giant 99 centimeter long turtle. Gameron has a speedometer that pops up out of it's shell to show it's riders what speed he is moving at. Gameron has the ability to fly at high speeds, and can also become transparent allowing it and it's riders to move through walls. Gameron was killed by the Kai Dragon in one quick shot. Gameron unfortunately never stood a chance against the mystical Kai Dragon. Ultra Q Review: Episode 6 Grow up, Little Turtle! This episode is about a boy who has a pet turtle and believes that it will grow to 99 centimeters and then take him to a Dragon Palace where he will meet a Princess and she will make him the king. When the boy gets in trouble for trying to feed his turtle in class, the teacher sends him to the roof to stay alone for the rest of the day. While on the roof the boy witnesses a bank robbery, when he runs down to the teachers office the teacher yells at him for lying and tells him to leave. The robbers then come into the school to hide from the police, then the boys turtle Gameron bites onto one of the robbers and they decide to run for a truck and stow away in the back to escape. Realizing that the turtle was with the robbers the boy chases them and gets pulled into the truck with the robbers. The boy yells at the robbers for stealing the turtle but the robbers explain to him that the turtle bit on and would not let go. While driving the truck gets to a check point and the robbers begin preparring their guns for a shot out. Seeing the robbers machine guns the boy gets excited because he had never seen one in real life so he some how annoys one enough to let him play with it. The boy begins playing with the gun and pretending to shoot the robbers when the boy try to really fire the gun it is jammed so he looks down the barrel and tries to pull the trigger the robbers flip out and go to pull the gun from him when they take the gun it becomes unjammed and fires off by itself. 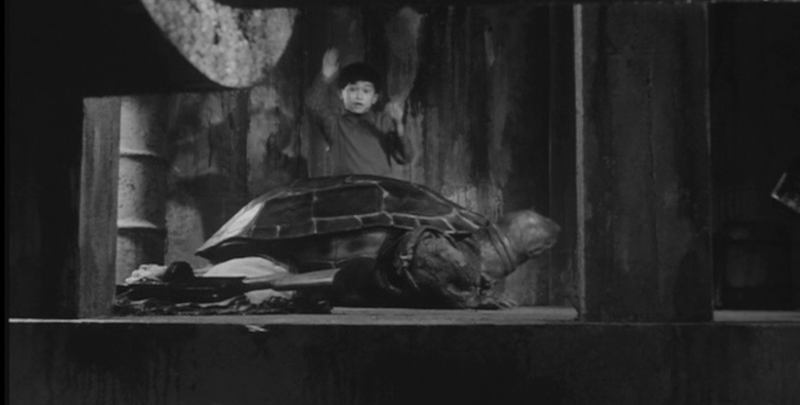 The boy picks the gun up and the robbers run away with the turtle Gameron still latched on to them. The boy begins chasing the robbers while holding the gun and the cops see this happen and follow the robbers manage to lose the cops by running through a carnival, but the boy keeps up desperate to get his turtle back.